BHIB Insurance Brokers (as well as the other companies in the group, Brokerbility, Brokertech and Churchill Insurance Consultants) have been shortlisted for the ‘Employer of the Year’ Award and the ‘Professional Services’ Award at the Leicester Mercury Business Awards 2019. The annual awards highlight Leicestershire’s best companies whilst showcasing their achievements. The night celebrates companies who have put the region on the map, boosted the local economy and made a positive impact within the local community. The ‘Employer of the Year’ category recognises those companies that have shown a strong investment in employees through initiatives such as reward schemes and other key employee benefits. We take pride in our engagement with staff at all levels within the company and the impact this has on our efficiency and customer service levels. We are delighted to have created a positive company culture that encourages progression, development and equal opportunity initiatives. The ‘Professional Services Award’ acknowledges those companies that have demonstrated strengths in service excellence, business growth, innovation, technology, training and personal development. We are proud that we are able to adapt as a company and constantly innovate, allowing us to keep up with changing industry trends, achieve our objectives and create a competitive edge. 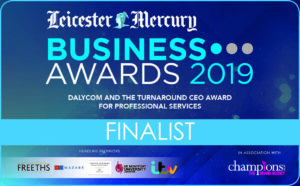 BHIB Insurance Brokers are also sponsoring the ‘Not-For-Profit Organisation of the Year’ Award at the Leicester Mercury Business Awards 2019, for the second year running. We have thoroughly enjoyed judging the entries this year. These awards highlight and recognise the amazing work that goes on in our community and we have learnt so much about all the unique organisations that have put themselves forward for the award. Read more about why we sponsored the awards here.